There's so much more to Pattaya than mere neon nightlife and an idyllic blend of sand, sea and sunshine. From thrilling temples to panoramic viewpoints, rare orchid farms to offbeat museums, Pattaya is brimful of entertaining diversions and unusual sights worth checking out. Never miss out on what to see in Pattaya again. This comprehensive index of all must-see attractions is designed to help you plan your sightseeing activities even before you arrive. Simply browse through the list and pick the ones that are of interest to you. With all the major attractions in one place, you will end up saving so much time on your research. The Flight Of The Gibbon is quite a new tourist attraction to the Pattaya area but it has quickly become established along with it's sister venture in Chiang Mai as one of the leading Thailand tourist attractions. Based on a concept devised by Eco scientists many years ago in Costa Rica so they could more closely study the Eco system of the rain forest canopies using a system of zip lines, platforms and pulleys, the Flight Of The Gibbon has made this once exclusive domain a thrilling adventure for everyone. Nong Nooch tropical garden close to Pattaya is the largest botanical garden in South East Asia. Set in a 600-acre beautifully landscaped park, the village features orchid nurseries, a cactus garden and a man-made lake. Daily cultural shows include folk dances, traditional ceremonies, sword fighting, Thai boxing demonstrations and an elephant show. Koh Larn (Ko lan or Larn Island) is an island situated near Pattaya City. It is also one of most recommended attractions of Pattaya. As visitors can enjoy white sandy beaches and coral reefs there, it is suitable for any kinds of tourists to visit. Whether visitors enjoy quiet atmosphere or busy environment, they can find it in the island. Near koh Larn, there are also two small islands, where these small islands are famous for coral reefs. One of the largest and most modern aquariums in Asia, Underwater World Pattaya has a sub aqua tunnel divided into three different zones: Coral Reef, Shark and Ray, and the Giant Siam – all offer great views of the more than 200 different Marine species, including a rare shovelnose ray - a hybrid between a shark and a stingray. Near the entrance, there is a Touch Pool displaying creatures found in rock pools at coastal areas around Thailand. 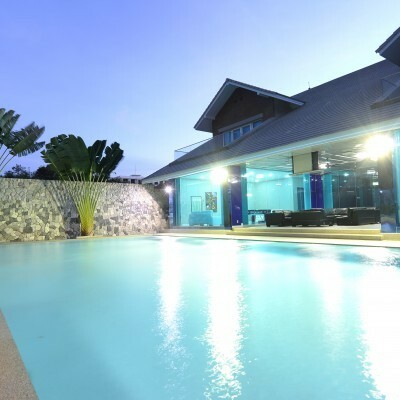 The pool allows interaction between visitors and the marine animals. One of Pattaya's favorite day-time attractions, the park covers a large area with rock gardens on beautifully landscaped grounds. Interesting sights include fossilised plants of more than a million years old, 200-year old Thai-style bonsai trees, crocodile pools and a collection of rare animals such as albino bears. Crocodile round-ups, magic shows and animal performances are also major attractions. Alcazar Cabaret of Pattaya City is now well-know throughout most of the world in equivalence to both Lido & Moulin Rouge of Paris. But Alcazar is different that Drag Queen stages it. Alcazar was not accepted at its early days of establishment when audiences misinterpreted our shows. After years of working hard & developing their technology, Alcazar of today is a world's acclaim. Alcazar on Pattaya II Road offers three shows daily at 6 p.m., 8 p.m. and 9.30 p.m. with an extra show on Saturdays at 11 p.m.
Encounters with ladyboys in Pattaya typically follow a predictable pattern: you either get groped or relieved of your wallet. The truly blighted, may even experience both. Not so at Tiffany's, the seafront city's world-famous and 30 year-old ladyboy cabaret extravaganza. Here, three times each night, a surgically and hormonally-enhanced army of transgender performers put on a show that shatters that fearsome reputation. With painted nails, delicious pouts and feline grace, not only do they look ladylike, they even act it. Rising 105 metres into the sky and exquisitely carved entirely out of teak wood, The Sanctuary of Truth is a gigantic wooden construction that's one of a kind in the world. A strange fusion of religion, philosophy, art and culture, it's neither a temple, nor palace 'even though it looks a bit like a hybrid of both. Best described as a monument to Thai craftsmanship, and a place to reflect, its awe-inspiring wooden sculptures and cravings pays homage to and is a reflection of the “Ancient Vision of Earth', “Ancient Knowledge'and “Eastern Philosophy'. Thanks to the Beatles, we have all heard about the yellow submarine, and now you can go in the real thing? At Pattaya, you can. Traveling at a maximum speed of seven knots, this bright yellow vessel can dive to the depth of 100 meters. Take a ride and explore the beautiful coral and marine animals just off the coast of Pattaya – without getting your hair or feet wet. Leaving Pattaya at 06:30am and proceed to Wat Taimtr, Golden Buddha and China Town. You will also visit Wat Po, The Temple Of The Reclining Buddha. Then taking a long tail boat on the Chao Praya river and the klongs where you will see the daily life of the Thai people who live there and has changed little for centuries. Stopping at the Ancient Wat Arun which has become a symbol of Bangkok. Cross the river to the Royal Palace with it's different buildings constructed by the Kings. Visit Wat Phra Kaew home to the most sacred relic of Buddhism, the Emerald Buddha. After lunch go to the National Museum and return to Pattaya. Departure time from Pattaya at 06:30 am. First visit will be at Bang Pa In, the former summer place of KIng Rama 5 who was leading the country at it's most prosperous time. Proceeding to Wat Pha Nan Choern by boat and then to Wai Yai Chaimongkol, a temple of great victory which was built by King Naresuan to commemorate his victory over Prince of Burma n 1592 AD. The next temples that we will visit is Wat Mahathat and Wat Rachaburana which is the cremation site of two Princes who were both killed on elephant back duel fighting each other for the throne. Afterwards we will proceed to Wat Sisanpet the formor temple and palace burnt in 1767 AD. The last temple that we will visit is Wat Napramain the only temple that was not destroyed by the Burmese War. Lunch will be served in a restaurant nearby. Beautiful island is about 50 minutes driving from Pattaya. You'll find Ko Samet to be a traveller's paradise of magnificent beaches, delicious seafood and dozens of choices for nightlife. As Ko Samet misses most of the heavy monsoon that plagues other islands, the weather is guaranteed to be pleasant at almost any time of year. This two-day tour through Kanchanaburi province gives you the chance to enjoy its rugged scenery while gaining insight into the area's tragic WWII history. Tour includes visiting the War Museum, Allied War Cemetery and famous Bridge over the River Kwai. On day two, visiting Hell Fire Pass Memorial and a ride on the Death Railway which cuts through picturesque countryside and cost thousands of POWs lives. Large discounts for longer stays. If you find a cheaper rate online we will match it. Find the best conditions on our website. 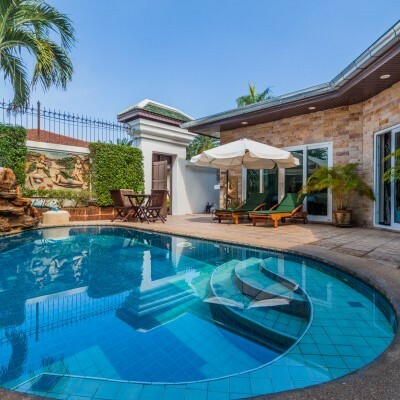 We will provide free transfer from Bangkok airport for any 7+ days villas reservations. Enjoy real beach holiday on nearby Koh Larn Island.